Pull a directory of payroll contacts now using this ready-made, pre-built data product. You can find contacts within the payroll departments of numerous companies and nonprofit institutions. 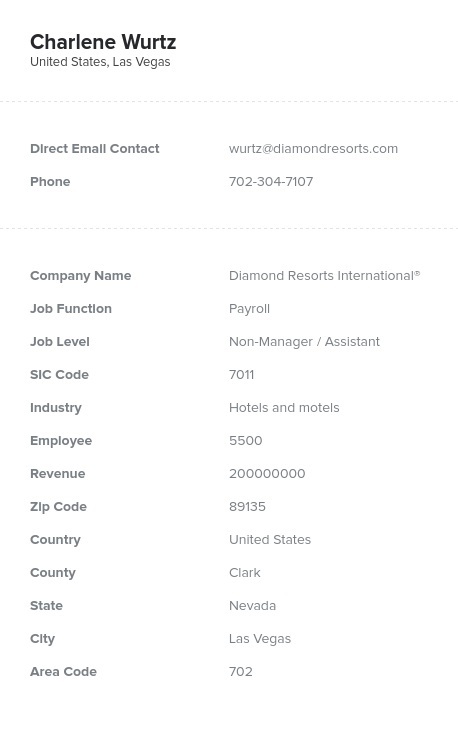 Download this payroll email list, integrate it into your CRM, and start networking! Find payroll professionals quickly and easily with the help of this extensive data product. Within minutes of purchasing this email list, you can start communicating with professionals within this specific, targeted, business-to-business (B2B) audience. This valuable list can enable a company or start-up to market their useful software, tracking tool, bookkeeping services, or other payroll-related product or service to an important group of decision-makers. It can also be used to network with dedicated payroll professionals across many different organizations. Payroll staff, officers, and professionals are responsible for calculating wages paid to employees within a company. The accuracy and efficiency of these processes is essential to everyone in a business, from entry-level employees to executives. They also deal with taxes, labor laws, and many nuanced company polices and rules. If your company can help payroll staff provide accurate payments more quickly and efficiently, definitely let them know by using this list. To communicate with this group, download this extensive data product now (which contains not only emails but numbers, addresses, titles, and more). You can also zero in on your target audience with our list-builder tool. Contact the right people with Bookyourdata.com!